In this 6 week Aroma & Sound Yin Yoga Course you will follow a weekly yin yoga practise. Every class we will work with a different theme and make use of sound, mantra and essential oils in order to engage the senses and to relax body & mind. Below you can read more about yin yoga, sounds, mantra and essential oils. Experience the benefits of spending more time – 2 to 5 minutes – in postures that are designed to increase flexibility in body & mind. Yin Yoga is a meditative form of yoga, where the focus lies on conscious movement, awareness and inner silence. The practise allows you to explore body, mind and soul. On a physical level yin yoga is really beneficial to stretch your muscles and release tension in the body. By turning inwards you also have the chance to explore your feelings and behavioral patters and breaking through the points were you got stuck. Sound is a form of energy, it consists of vibrations that we can feel and hear. Sound is a subtle form of space. What we can hear is a union of sound and space. You can reach silence with the help of sound. Silence is a part of sound. Every sound has its own effect on body and mind. It this workshop there will be sounds used in the yoga practised produced by singing bowls, drum, kalimba, harmonium and human voice. Every week we will also work with a mantra. A mantra is a syllable, a word or a group of words that has a psychological and spiritual power. ‘Man’ – means ‘mind’or ‘thinking proces’ and ‘Tra’ – means ‘instrument’ or ‘going beyond’. So literally a mantra is an instrument to go beyond the mind and it’s thinking process. The aroma of Essential oils stimulate the part of the brain that affects emotion. When you breathe oil molecules they are received by the brains olfactory center via the nostrils. Essential oils communicate to the limbic system to recall or release stored emotions and memories. The limbic system, that is responsible for the storage of emotions and memories, gets stimulated and sends information to the autonomic nervous system and activates the para-sympathetic nervous system that is responsible for homeostasis in the body, a state of well-being and balance. Using essential oils in the yoga practise can help to release tension and emotions that can appear. 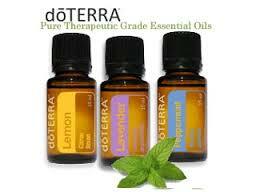 During the workshop we will use the dōTERRA essential oils. These oils are 100% natural and are of a Certified Pure Therapeutic Grade. After the course you will have a better understanding of the effect of the oils on body & mind and how to use them in your yoga practice.